Indiana limestone is abundant in the state. Some of the most flawless limestone can be found in a rich trough between Bedford and Bloomington referred to as Salem limestone. The Pentagon, the soaring National Cathedral and the solemn Lincoln Memorial in Washington, D.C., New York City’s Empire State Building, the Biltmore Mansion is Ashville, North Carolina, and 35 of the 50 state capitol buildings were built with Indiana limestone. It is a beautiful, rich cream-colored stone that is fairly easy to work. Generations of talented carvers learned their craft in this state, and it continues to be a place of gifted and creative carvers. Not only can the stone carvers’ talents be seen in spectacular buildings but even in modest tombstones across the state. Indiana has thousands of tree-stump tombstones that dot cemeteries through the entire state and exported throughout the country. The carvers have also created one-off works of art. One such marker, photographed by my friend and neighbor, Doug Parker, is the tombstone of Charles Jacob Affelder in the Chesterton Cemetery in Chesterton, Indiana, in the Northwest corner of the state. 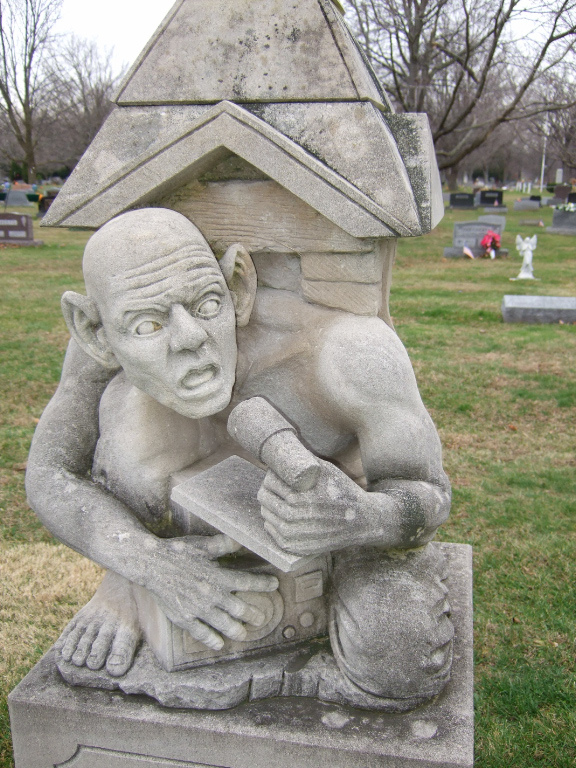 The tombstone has a figure that some people on various Web sites refer to as a Gollum-like creature from Tolkien’s The Hobbit, crouching under a gothic roof. The bare-chested man has his right hand resting on the top of a ham radio and his other hand is clutching a microphone. 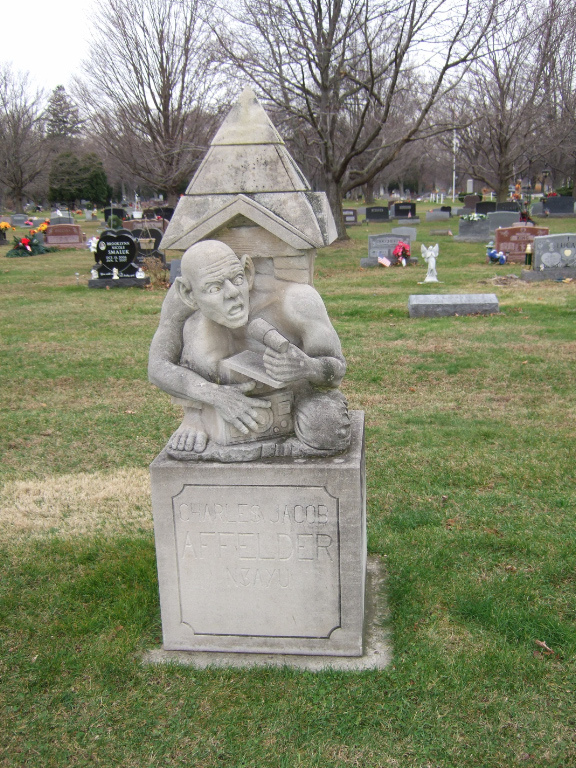 Carved on the front of the tombstone is, “Charles Jacob Affelder, N3AYU.” The tombstone is a curious sight, in an otherwise average Midwestern cemetery. Further investigation of the deceased Affelder reveals that he was born August 5, 1915, in Allegheny County, Pennsylvania. He was an avid ham radio enthusiast. The mix of letters and numbers, A3AYU, listed underneath his name was his ham radio callsign. Affelder had been a ham operator since 1933. He held several patents for improvements to the radio microphone, perhaps memorialized in stone on his marker. Affelder also worked for KDKA in Pittsburgh and for the Voice of America behind the scenes as an engineer. Affelder’s tombstone is a tribute to his love of the radio world to which he dedicated so much of his life and career. Charles Jacob Affelder died on January 10, 1994, at Chesterton, Porter County, Indiana. The Gollum in illustrated versions of the Hobbit look much like the figure clutching this radio–bald, bulging eyes, sloped shoulders, and muscular. It is a similarity in look. Great photo of a fascinating and quite unusual monument.